When it comes to statement fashion, it's always a risk that either pays off or completely crashes. I often like to play it safe, and I know what trends suit me and what don't. It is very easy to get swept up in what the world is loving, even if it doesn't really represent who we truly are or what we actually like. This is even more emphasised within the online chaos of social media. A trend that always comes back around is leopard print, and admittedly, I am a fan. Although, it must be done right. With statement garments such as prints or bright colours, I feel the need to style them accordingly to my taste. 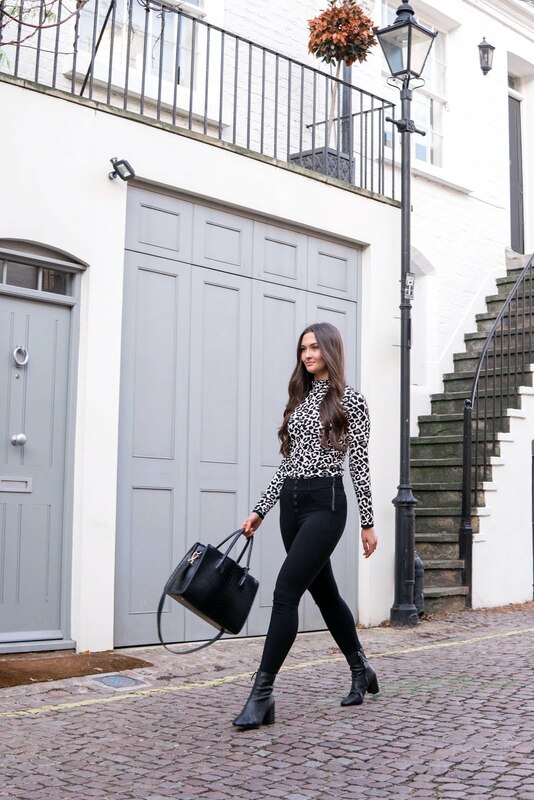 When styling a statement piece such as this monochrome leopard knit top, I emphasise the statement by styling it with an otherwise block colour outfit. This all black look works well with the monochrome print as it ties together its colours. The one colour enables the print to stand out whilst incorporating its details. As an overall package, it works. Similarly, statement accessories are one of my own favourable ways to make a statement. For example, statement handbags can look absolutely fabulous with otherwise casual outfits. This is because they draw the attention of the eyes to one sole focus. When it comes to statement dressing, most of us automatically assume neon, glitter, metallics, and bold prints, but why not make your own statement? Your statement is all down to your own styling. You can make a neutral tone accessory look absolutely incredible next to dark colours, or all white outfits. Don't be simpleminded when it comes to statements. You can always create your own.